TD: LR: Smart cities are on track to offer citizens a plethora of real-time, on-demand services. When well optimised, smart city technology should embed itself so naturally into the fabric of society that it becomes invisible. Often described as concrete jungles, cities are home to more than half the world’s human population. These urban centres have much to offer their denizens in terms of convenience and job opportunities, but at the same time, issues surrounding liveability and sustainability have arisen. To address these concerns, governments around the world are actively applying technological solutions, using data and digital applications to streamline processes and provide better public services. But are smart cities, as such technology-driven metropolises are called, really improving the lives of citizens? 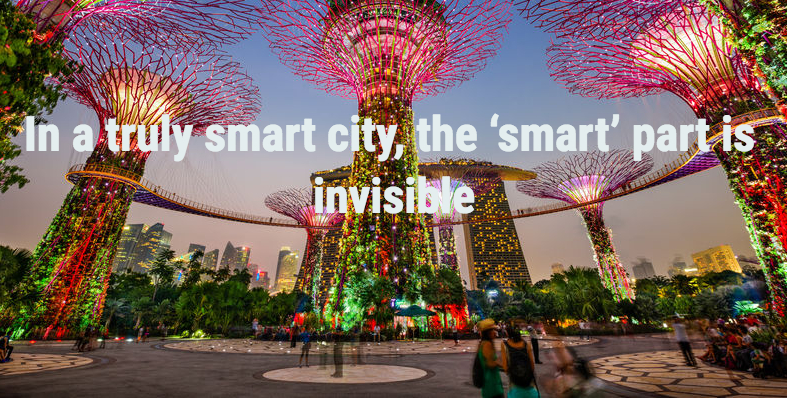 On 14 March 2018, a panel of experts considered this question at a seminar titled ‘Smart City: How close are we to realising the vision?’, recorded at Singapore Management University (SMU) as part of Channel NewsAsia’s Perspectives television series. The speakers included Professor Archan Misra, SMU associate dean for research and director of the SMU Centre for Applied Smart-Nation Analytics; Mr Koen Cardon, chief executive officer, Katoen Natie; Ms Jacqueline Poh, chief executive, Government Technology Agency of Singapore (GovTech); and Dr Hee Limin, director of research, Centre for Liveable Cities. Veteran journalist and broadcaster Mr Teymoor Nabili moderated the session. Novel as the idea of a smart city may be, there have already been several iterations of it, Professor Misra noted. The first wave of the smart city movement involved e-governance, where citizens could file their taxes digitally and submit online applications requesting government services, thus saving them time. The second wave manifested in the form of harnessing big data for very specific tasks, said Professor Misra. In the city of Chicago in the US, for example, authorities were able to predict the timing, likelihood and location of rodent infestations by crunching data from reports of food poisoning outbreaks, he said. But what’s on the horizon is considered the holy grail of smart cities—the ability to respond to citizens’ needs in real time. With increasing prevalence of the Internet of Things and sensor networks, Professor Misra thinks this ideal is fast approaching reality. For instance, cities may soon be able to tweak the frequency of buses based on real-time demand for transportation, or adjust street lighting according to crowd levels. “These are important for the government and the municipal authorities because of the cost savings and operational efficiencies, but they also improve the liveability [of a city] because [citizens] actually derive benefits from it,” said Professor Misra. In its ideal form, a smart city delivers value to its citizens in subtle and intuitive ways. Like electricity that runs unnoticed through cables to power virtually every modern device, the best smart city technologies are invisible because they are so embedded within the fabric of society, said GovTech’s Ms Poh. “I think people don’t realise that 80 percent of what a smart city offers to its denizens is not going to be anything that looks like an interface,” she said. How Singapore relies heavily on data for urban planning is a case in point. “[The data] informs where physical infrastructure is placed, so a lot of citizens actually enjoy the benefits of having a city designed in a certain way,” she explained. Adding to this point, Dr Hee highlighted how Singapore’s Housing and Development Board uses data analytics to better plan apartment blocks. Parameters such as wind, shading and urban heat effect are modelled and simulated even before the first brick is laid, so that when the buildings are finally constructed, living conditions are more pleasurable, she said. Meanwhile, sensors would also help housing estates be more resource-efficient and save on costs. “The need for maintenance would also be conveyed through sensors, so you don’t even need to inform town councils about any problems arising,” Dr Hee quipped. While the upsides of a smart city are alluring, they come at a cost. Citizens are asked to volunteer something intimate, intangible and immensely valuable—their data. Concerns over data protection and privacy have thus surfaced. Mr Cardon noted that in the era of smart cities, trust between people and their governments, as well as between corporations and the public sector, is essential. “There needs to be a lot more trust so you can optimise or enrich [smart city technologies] and improve quality of life,” he concluded.